There was no way that I was going to be able to walk past this book without buying it. Pencils on the cover? (Yes, I'm that shallow.) 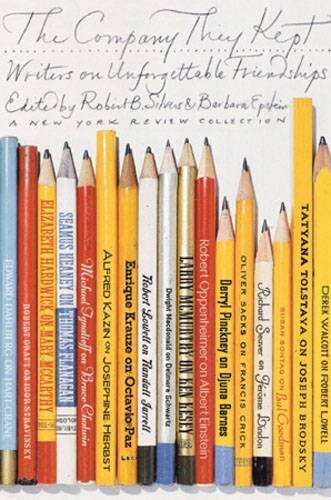 The promise of writers writing about their friendship with other writers, artists, and other amazing minds culled from the pages of the New York Review of Books? (Yes, I can be a bit of an intellectual snob.) It seemed like it would be perfect for me. While it was indeed mostly what it claims on the cover, it was also boring, a cardinal sin in my book world. This is a collection of short essays written by well known authors about their late friends and the influence those friends had on their writing. In at least one case, the subject and the author hadn't met or corresponded so weren't actually friends and in others, the pairs seem to be more acquaintances than friends. And this fact leads directly to one of the things I found so lacking. In these cases, there was no personal insight into the subject. There was nothing more here than what an introduction to their collected works or an encyclopedia would say about them. There was a discussion of their influence or their craft but not as much (and sometimes nothing at all) about the person behind the writing, music, science, etc. Certainly I'm not arguing that the essays, all of which are understandably eulogistic in tone, should lay bare the person about whom they were written but asking for a piece written by a friend would imply to me that there was a personal connection that could or should be mined a little bit, an insight the general public or a diligent scholar would not have. Those remembered by these essays were certainly lions in their fields but they were men and women first, not solely defined by their works, and that is what I was looking and hoping for here, the personal. The authors whose works I had read were no more illuminating to me than the authors whose works I had never read, nor did these pieces inspire me to search them out. There were a few pieces that defied this academic remove but they only served to highlight the missing warmth and humanity in the bulk of the pieces. The writing is, as you'd expect, quite impressive, but it's also on balance quite cold. May my own obituary (far in the future, please) be full of far more feeling than was evinced here!